The Month in Theydon (September): Trevor Roberts latest report is on line Click Here. Parish Council Minutes: The minutes for the meeting of the 27th September 2007 are now available. Click Here. September 2007 Village News: The latest quarterly PDF version of Issue 59 of Village News is now available on line. Click Here. The new Theydon Wood that is being established by the Woodland Trust near the village between the village cemetery and the M11 motorway and which will form part of the 'Green Arc' was given an extra boost on Saturday 27th October when members of the buddhist London Fo Guang Temple donated a cheque for £8,250 towards the trust work at the Theydon Wood site. Councillors from EFDC and our Parish Council attended the presentation ceremony together with Villagers, representatives of the Woodland Trust, The Green Arc Project and Theydon Bois and District Rural Preservation Society, who had previously donated a £1,000 towards the planting of the wood. 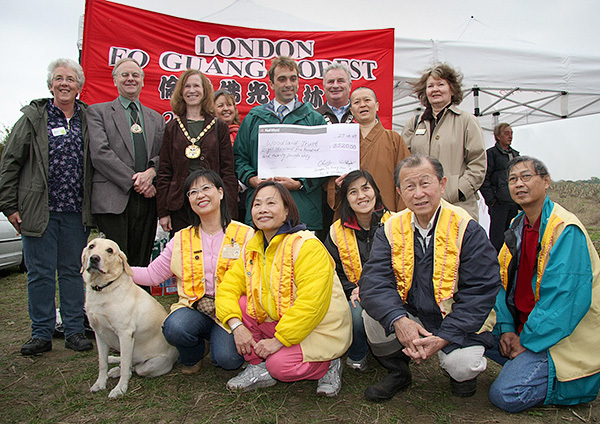 After the presentation ceremony all those present involved themselves with the planting of 1,500 new trees and then enjoyed refreshments provided by the Fo Guang Temple. There is still much work to do and the Fo Guang Temple members intend to help plant 5,000 trees at the site. Individuals can make donations of dedicated trees on the Woodland Trust Web Site. We have more pictures of the event here. Remembrance Sunday: Our annual Service of Remembrance will take place on Sunday 11th November, 2007 starting at the War Memorial, St. Mary’s Church, Coppice Row at 10.45 a.m. and continuing in the Church for the main part of the service. In the event of inclement weather the entire service will take place in the Church. Medals may be worn and standards carried. Everyone is welcome. Founded in 1921 as a voice for the ex-service community, it has become the UK’s leading charity providing financial, social and emotional support to millions who have served and are currently serving in the British Armed Forces and their dependants. 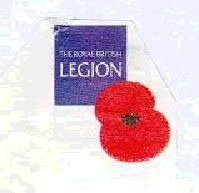 The Legion has a membership of some 500,000 Members. In 1922 poppies were found growing in abundance amid crosses and burial grounds in the fields in Flanders and became the symbol of the Royal British Legion. My appeal is again this year, please do give generously when you see the poppy sellers outside the shops or they call on you at your homes and please ‘Wear your poppy with pride’. I have a further appeal to residents in Theydon Bois. Due to age, illness and incapacity we have lost some of our regular poppy sellers and need volunteers to take their place. Can you please spare an hour or so any time between Saturday 3rd and Saturday 10th November helping to sell poppies? Please contact our poppy organiser, Alan Hollingbery, at 31 Forest Drive. Tel: 01992 813260. Thank you. Finally, a big thank you to all who responded to my Falklands 25th Anniversary Appeal in June this year. Your generosity is appreciated. On Wednesday 17th October an agent of Blunts Farm Estates Limited, a subsidiary of Aitch Group informed the Planning Inspectorate that they wished to withdraw their appeals against the two Enforcement Notices served by EFDC. This means that there will no longer be a public enquiry which was scheduled for January 2008. The owners of Parsonage Golf will now have two years to comply with the two enforcement notices or be prosecuted. They will have to fill the voids with materials already on site, they can not import any more waste, it is unlikely that they would wish to export any waste. A statement detailing their methodology for the filling of the voids will have to be agreed by EFDC. They will not be compelled to complete the golf course, in fact they have indicated to EFDC that they now no longer wish to complete the course. We can only assume that the appellants withdrew their appeal because they no longer feel they could win. We can assume that the receipt of the impelling Statements of Case from both EFDC and TBAAG (who had been granted Rule 6 Status by the Planning Inspectorate for the enquiry) together with the strong submissions to the Planning Inspectorate by Theydon Bois & Lambourne Parish Councils, Theydon Bois and District Rural Preservation Society and the many letters of objection from villagers to the Inspectorate aided their decision. The Developer may have also become concerned at the growing National Press interest in what was happening to our Green Belt at this site. Channel 5 News recently featured a news item with Sue Sowerby Chairperson of TBAAG and both the Sunday Mail and the Sunday Times have expressed interest in the story. This may be a victory, residents may have won this round, but we are sure these developers will have another trick up their sleeves. Their permission for a clubhouse on the site which was part of the original application expires in December, their compromise application EPF/2195/06 is incomplete and likely to be refused by EFDC and they have seemingly lost their appetite to complete their original application EPF/0765/99. Whatever their intentions, they will have to re apply for permission to EFDC. And whatever they have planned everyone will now be looking very closely at the detail of any new application from this development team who seem so keen to ruin our countryside and Metropolitan Green Belt. New St. Mary's Church Web Site: The church now have their own web site URL, which is online at: http://www.stmarystheydonbois.org.uk/ we have added this link to the Home page and Links page of our site and are in discussions with the church about how we change their page on this site. 90 Magazines from all over Essex entered this years Essex Life Community Magazine Awards Competition run by the RCCE (Rural Community Council of Essex), which was sponsored by Essex Life Magazine & the Church of England, Diocese of Chelmsford. 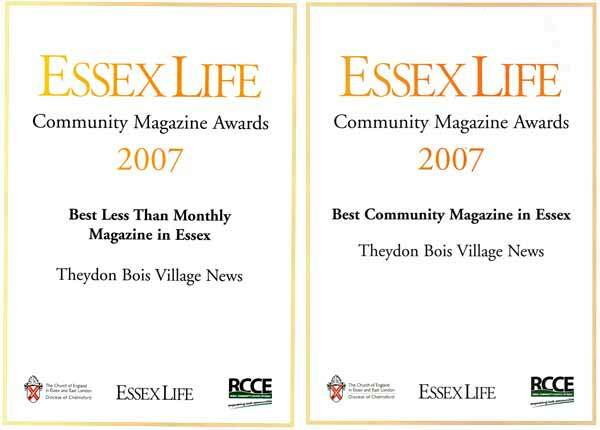 Theydon Bois Village News was selected as one of the 13 finalists and at the award ceremony at Le Talbooth, Dedham on 3rd October 2007 we came away with two top awards, Best less than Monthly Magazine (a £50 prize) and Best Community Magazine in Essex (the overall top prize of £100). The competition was judged by Essex Life editor, Julian Read and Newport News Community Magazine editor, John Gordon MBE who together with Nick Shuttleworth of RCCE presented the prizes to Theydon Bois Village News editor, Tony Ames, who was accompanied at the awards ceremony by Madeline McCarthy, our Parish Clerk and Village News CoOrdinator and Jim Watts, editor of our Village Web Site, and also a Village News contributor. The judges praised the 'crisp' presentation of our magazine, the good use of colour and the standard of the news stories. Tony Ames expressed great surprise at our win, but said" it was all down to the hard work and dedication of all who contribute to the production and distribution of our village magazine. It's a great team and community effort that has been awarded here". Parish Council Chairman, Robert Glozier said "I’ve just been into the Office to see the Certificates, (and ensure the safety of the £150 cheque). Congratulations to all concerned, a great result.What with this award, and the “Best Kept Village” one, we seem to be on a bit of a roll at the moment, long may it continue. 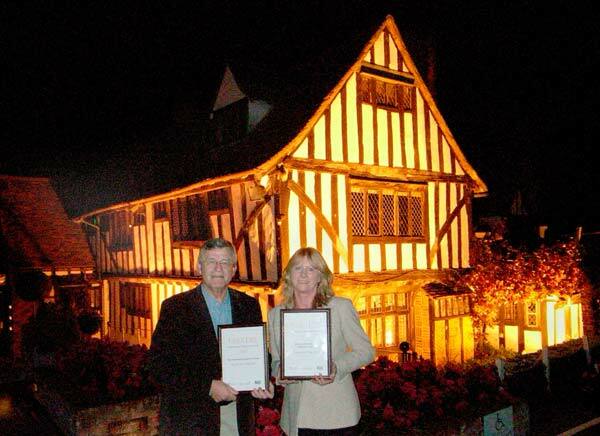 Tony Ames & Madeleine McCarthy show off the Winners Certificates outside Le Talbooth Restaurant, Dedham. Channel Five News Report on Blunts Farm Development: Sue Sowerby Chairperson of TBAAG (Theydon Bois & Abridge Action Group) was filmed by Channel Five News for a "My News" report on the Parsonage Golf/Blunts Farm Development. The program was broadcast three times on Wednesday 26th September, but if you missed it,or want to see it again, you can see a slightly extended version here. Blunts Farm: Time for representations to the Planning Application EPF/2195/07 outstanding since 17th November 2006 will now run out in the first week of October. The application is for new work at the Parsonage Golf/Blunts Farm site. EFDC had said that they would allow objections beyond the normal 3 week period, up till the time the application was due to go before the Development Control Committee, because of the controversy surrounding this application. Despite a 'Scoping Report' being produced and many contacts from EFDC, the developer has failed to produce the required Environmental Impact Assessment and the application will now be considered without this. If you have not yet made any comments about this application which has important implications for the whole of our village EFDC would still like to hear from you up to 5th October. It is possible to view the application at the EFDC web site HERE and note your objections HERE . The Enforcement Notices applied to Blunts Farm by EFDC that prevent further work and lorry movements are still in effect, but are the subject of an appeal and an enquiry, which is now set for January 2008 in Epping. Closing date for representations on this appeal passed on 10th September. The Parish Council, Theydon Bois & District Rural Preservation Society and TBAAG have all made strong representations in support of the EFDC Enforcement Notices. 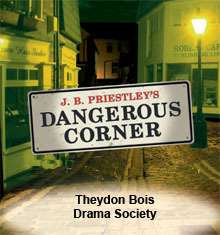 'Dangerous Corner' - a thriller by J B Priestley. Dates are Thurs 25th - Sat 27th October 2007, at Theydon Bois Village Hall, Coppice Row, Theydon Bois. Performances start at 8.00 pm, tickets are £6.50. Box office is as always - Mr and Mrs James - 01992 812250. "All seems well at the Caplan's publishing house - until a can of worms is unceremoniously unleashed at Robert and Freda Caplan's dinner party. A chance remark plunges the guests into a re-examination of the mysterious events surrounding the recent death of Robert's brother Martin. Life will never be the same... or will it?!" Clubs & Societies: Thinking of taking up a new interest or hobby this autumn. Theydon Bois has many clubs and societies catering for all sorts of interests. Many meet regularly in the Village Hall and a few easily accessed sites around the village. We have updated all the contact details on our Clubs and Societies page so that you know who to contact. If you run a club in the village and you are not listed just send us your contact details for inclusion. 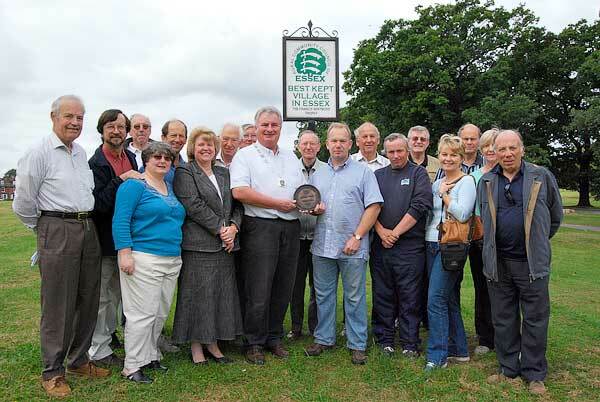 Theydon Bois - Best Kept Village 2007: Yes we have won again! 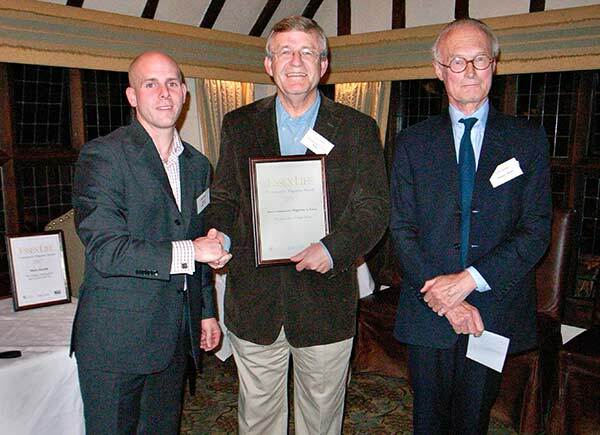 We are very pleased to have won the Color Gas sponsored Best Kept Village Award 2007 for ‘Best in Class 2’ (villages with a population of 2,000 – 5,000) run by the Rural Community Council of Essex. We were judged against 15 other entrants in our class, and the competition as a whole had over 80 entrants. In winning we received a cheque for £150, a framed certificate and the Whitmore Trophy plaque which will be on display in the Village Hall. We are allowed to keep the Best Kept Village Sign, which has been put up on the Village Green, for one year. We previously won this competition in 2004. The Parish Council would like to extend our appreciation to all those who have helped in winning and our thanks go to our hardworking and amiable street cleaner, Sean Watson, who we hope will be able to stay in the Village as Sita will being taking over the re-cycling and street cleaning contract in November. New Road Signs: Three of these new signs are now sited in the Village on the hilly sections of Coppice Row, Piercing Hill and in Loughton Lane. Already they appear to have been effective so that drivers and even runners training for marathons have been brought under control. So in this respect they are welcome, despite being three further items of street furniture which detract from the scenic beauty of Theydon Bois. They are powered by solar panels at their top, which give the appearance of tall ladies with their hats askew, and they are therefore environmentally friendly. But how effective they can be with drivers who are determined to break the speed limit only time will tell, and hopefully the new signs will encourage a return to good driving/cycling habits and a renewed consideration for other road users, especially in Theydon Bois. Theydon Bois & District Rural Preservation Society: Do you make a note in your diary of things you don’t want to miss? Here’s something I hope you will enter now! 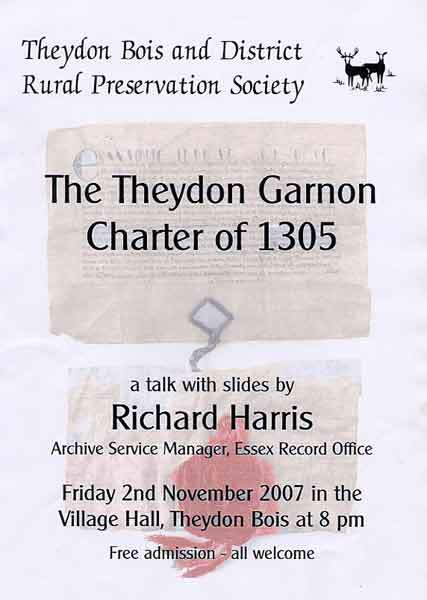 On Friday 2 November at 8.00 pm the Society has arranged for the 700-year-old Theydon Garnon Charter to be on display in the Village Hall when Richard Harris, the Archive Service Manager of the Essex Record Office, will put it in its historical context and explain its meaning and significance with an illustrated talk. The Charter was granted by Edward I in 1305 to ‘Hugh Gernoun of Theyden Gernoun’ and is written on parchment (animal-skin) and still has the green and yellow silk cords joining it to the King’s great seal inscribed on a large disc of green wax. No one knew of its existence until it was discovered some 25 years ago in a long forgotten deed box by a City of London firm that was moving to new premises. It now belongs to the Society and is kept at the Essex Record Office in Chelmsford. The Charter is written in Medieval Latin but we will provide an English translation! How many of today’s records will still be in existence – and readable – in 700 years? Come and see the real thing! Rubbish Collection & Recycling: On the 11th July Epping Forest District Council announced some changes to the re-cycling of plastics. In addition to plastic bottles(such as milk bottles, drinks bottles, detergent bottles, shampoo and conditioner bottles) residents can now recycle margarine tubs, ice cream tubs, yogurt pots, plastic food/vegetable trays and plastic bags by using the clear plastic sacks provided by the council free of charge. Bottle lids are now recyclable but it is best to squash bottles down to aid compaction. The Parish Council has also been advised that a contract has been agreed with a new contractor for the collection of rubbish and this provides for weekly collections for twenty weeks in the summer. A weekly food waste collection is also being considered. Theydon Bois Music Society 2007 - 2008 Season: The Theydon Bois Music Society is a thriving organisation which for 9 months of the year presents excellent classical concerts at the Village Hall, Theydon Bois. It meets on the 2nd Thursday of the month and the annual subscription is £40 for all 9 2007/8 concerts, or tickets on the door cost £8. Two or three London concerts are arranged each year, traveling by coach, at a reduced rate. Please contact Barbara O'Connor on 01992 573202 or just turn up when you will be very welcome. The season starts off at 8 pm on 13th September with Tim Wells & Agon Piano Trio (violin, cello and piano). More details of the Society and all 2007/8 concerts are here. The Theydon Bois Folk, Country and Barn Dance Club latest season: starts from 18th September 2005 at 7.30pm in the New Village Hall and runs on Tuesdays until 6th December. At the moment all nights in this season are designated as 'Club Nights' but we hope to book music and callers for some of these dates soon. If you enjoy gentle exercise, music and laughter why not come long and join in. New members are very welcome and you don't even need a partner, just a sense of humour. More details here. We meet at fortnightly intervals on Wednesdays, in the halls behind the Baptist Church from 10:15 to 12:00 noon. October 10	“Teaching in the USA”- Barry Greenhaigh. Oct. 24	“Reading the Waves: a life in Electronics”- Peter Fitch. Oct. 27 London Walk: ‘Little Venice’-	(Saturday) With Peter Lawrence. December 12	“Memories of Christmas”- The members. Neighbourhood Watch Update: The second neighbourhood action panel ,meeting for Theydon Bois was held at the Village hall on 15th of August, where there was good debate regarding local policing issue's. Three priorities were set, dealing with antisocial behaviour, increase in high visibility patrols and better communication. The meetings are an ideal opportunity for a cross section of the community to discuss local issue's and resolve them. I would encourage anyone who cares about the Village and would like to have an input in the meetings to contact me. The next meeting will be in November time. 3 Theft of motor vehicle, 4 thefts & 7 Criminal Damages. Again I would urge people to look after their property and ensure that when away properties are left locked & secure. In July 2 youths from the Romford area were arrested after being involved in road accident in Coopersale Lane, no doubtedly up to no good and not wanting to be found they were located in fields after a search by the Police helicopter and local officers. one of the youths was charged with road traffic offences and was bailed to appear before Harlow magistrates court. In the same month local Police and Community Support officers noticed two youths acting suspiciously in a vehicle in Station approach, they ran off but were later detained by Police and found to be in possession of drugs, they are currently on Police Bail pending further enquires. Pc Ray Hull still remains the 'Neighbourhood Specialist Officer' for Theydon Bois with two new Police Community Support Officers in place Jane Rudolph & Lizal Scott. Contact can be made with Epping Police station on 01992 625535. The local community Policing team can be contacted on 0777 9317211 (not manned 24 hours, however messages left will be replied to). Please take time to view the Essex Police website site, which has specific information regarding the area of Theydon Bois under Epping 'South East'. VILLAGE POST OFFICE: Theydon Bois Village Post Office has been run by Lorna Farrell for twenty –one years. Her trusty team consists of Ann and Marilyn who have been with Lorna for twenty years, Sue, Val and Louise (Lorna’s daughter-in-law) and the latest addition, Charlette who is an American, a great talking point at the counter. Lorna believes she has been really lucky with her staff over the years and remembers the time when she employed a man, Michael who was very popular with the ladies. 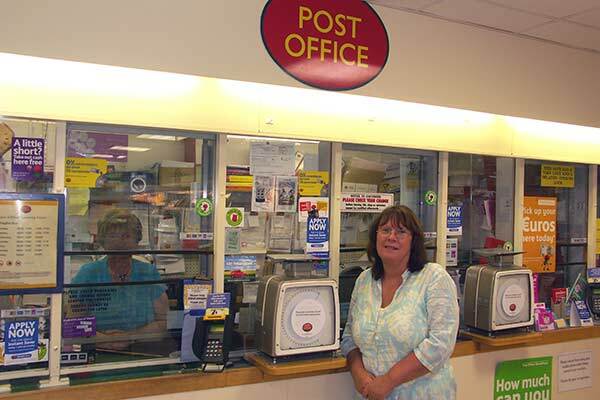 The Post Office is privately owned by Lorna , not Tesco’s and she has advised Village News that it is vitally important that her friends ( Lorna consider her customers to be friends, many of whom are on first name terms) continue to support the business because usage is a key consideration when Post Office Ltd make decisions about closures. Lorna fully understands that some of her services can now be accessed via the internet but, as I know from my own experience trying to renew car tax on line, as soon as something goes wrong you need to visit the Post Office anyway. The Village Post Office performs many of the services provided by main branches including on the spot Euros and Travel Insurance, Car Tax and Fishing Licence's. So next time you pop over to France for a days shopping remember where to get your cash. A limited free banking service is also offered including drawing cash and paying in to Co-op, Alliance and Leicester, Lloyds TSB, Nat West Flex account and Cahoot. For those villagers who wish to use the services of E-Bay the Post Office is happy to advise on postage costs and take care of despatch if you are lucky enough to sell. Our Village Post Office is one of the many examples of the benefits of living in Theydon Bois. They not only perform a valuable service but they do it in a friendly and helpful way and provide the only human voice some of our old people hear from one day to another. As for all the shops in the village USE IT OR LOOSE IT.